Its the spring of 1983 and no longer safe to be a Jew in Vienna. Nineteen-year-old Elise Landau is forced to leave her glittering life of parties and champagne to become a parlor maid in England. 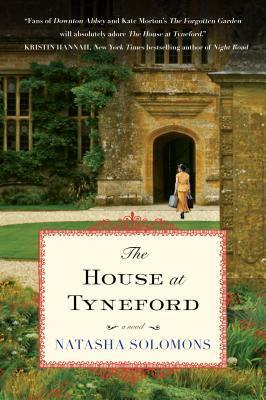 She arrives at Tyneford, the great house on the bay, where servants polish silver and serve drinks on the lawn. But war is coming, and the world is changing. When the master of Tyneford's young son, Kit, returns home, he and Elise strike up an unlikely friendship that will transform Tyneford - and Elise - forever. By Its Cover: Can I Visit? I saw this book on display at Barnes & Noble, and it was recommended for readers who liked Downton Abbey. Since I was in the middle of my DA addiction at the time, I was intrigued. And the cover totally sold me on it. It has such an atmospheric feel - can't you just picture yourself at this great English house? Elise is a Jew in Vienna, Austria. Her mother is a musician, and her father is a writer. They run in wealthy circles, and Elise is able to live in luxury. The Nazi occupation threatens not only their way of life, but their entire existence. Elise is able to secure a visa for herself, and she becomes a servant for an upper class family in England. Caught between two worlds, Elise doesn't fit in anywhere. She cannot relate to the servants - she is used to having servants for herself, not being one. And while she is able to connect with the master of the house and his son, she is still the help. I felt for Elise as she struggled to fit in and deal with the homesickness. She left her entire family behind, and she wants nothing more than for them to escape Vienna. I grew to truly love Elise, and I was so happy for her as began to find peace in her new life. Her journey was compelling and swept me away. Although she doesn't know it, Elise's arrival at Tyneford marks a profound change. She is the precursor to changes that will disrupt everyone's way of life and throw this cozy house by the sea off its axis. I don't want to say too much here for fear of spoiling something. But the love story was both lovely and devastating. Some of the events in this book broke my heart! I found the ending of this book slightly disappointing (only because I was quite surprised at a certain relationship), but this book is certainly worth reading. And I'll say this about the love story - I was obsessed and seriously swooning. Reading back over the quotes I highlighted from it brought it back to life and reminded just how much I had fallen in love with the love story in this book. So many good moments! One of my favorite things about this book was the way the author developed the setting. This book is absolutely defined by the house where it takes place. Elise blossoms because of the house and the nearby sea, and I absolutely loved that aspect of this book. I loved the descriptive writing, but I do recognize that it could be a turn-off for some. I thought it worked perfectly for this book because, in this case, it would be impossible to separate the story from its setting. The place influenced actions, and the actions influenced the ultimate fate of the place. Elise's father hides her list novel inside of a viola and gives it to Elise for safekeeping. It becomes such a symbol in this book. At this period in time, people were attempting to silence the Jews. I loved that Elise's father wants his words - his resistance - to survive. The revelation about the book inside is also quite fitting, and it prompts Elise to find her own voice and share her story. "On the page we live again, young and unknowing, everything yet to happen." "If history hadn’t forced me across Europe, would I have discovered that I loved the sea and big sky and fields of grass? It must have been hidden inside me like an oak tree in an acorn, or bluebells beneath the soil." "It is the storyteller’s prerogative to try to write, every now and then, the ending she might wish for. Even if it exists only on the white page." If you like historical fiction or Downton Abbey or the upstairs/downstairs or World War II... then you should read this book! I finished it in an afternoon by the pool, and I was so sad when it ended. This book lingered in my mind for days after, and I was glad I'd read it. It's not perfect, but I was absolutely enchanted by this book.